full body massage, TMJ dysfunction, and neuromuscular therapy. 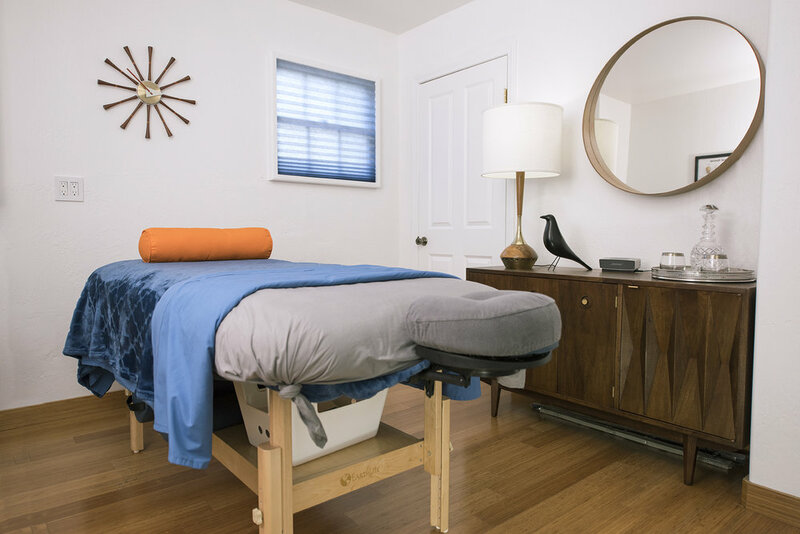 Combining elements of classic Swedish, deep tissue, craniosacral, trigger point, lymphatic drainage, reflexology and other modalities, allows me to custom tailor your bodywork experience whether you are looking for stress relief and relaxation, or pain management. “Steve Shepard, hands down, gave me one of the best massages I’ve had. He’s thorough and works on a holistic level throughout almost the entire muscle system. He worked out the knots in my back painlessly. He worked on my hands, feet, and scalp (which sometimes gets forgotten). I can’t recommend him enough. Book an appointment. For chronic pain, neck and back pain, sports injury, range of motion, and postural improvement. Includes neuromuscular and range of motion assessment. I can tailor a massage therapy session that brings deep relaxation and address specific areas of need. This is a full body massage, including feet, hands, scalp, and face (if desired). Soothing music, hot towels, and heated table enhance the relaxation experience. For an additional charge, you can relax and slumber an extra 15 minutes after the massage. Over the last three years, I have developed my own massage butter made from organic ingredients, including mango butter, Shea butter, sweet almond oil, and citrus essential oils. This massage butter absorbs quickly, nourishes the skin, and leaves you with soft, smooth skin—without any greasy feeling, and the scent dissipates quickly. Serving Santa Barbara, Montecito, Santa Ynez, Los Olivos, Solvang, Buellton, Goleta, Summerland, Carpinteria, & Ojai. I integrate various modalities to fit your unique needs. Focused, integrative bodywork can be very effective in managing the pain and discomfort and providing deep relaxation and stress relief. By integrating deep tissue, trigger point, craniosacral and other techniques, I have developed a method of gentle manipulation of the soft tissue and muscles to help correct muscle constriction, help alleviate pain, and help melt stress away. “One of the absolute best massages I’ve ever had, and I’ve had a lot! Super relaxing. Steve asks the right questions, listens, and then performs his ‘magic.’ I give him my highest recommendation. "I have been living with pain for as along as I can remember." Many of us suffer from pain that seems to have no explanation or have been told there is nothing that can be done about it. One of the reasons for this is often pain in one area of the body actually originated from another part of the body. When the body is injured it often compensates for the injury throwing the body out-of-balance resulting in pain in places other than the original injury. After the injury is healed, the pain from compensation can linger—sometime for years. Neuromuscular therapy takes this into consideration and works to find the source of pain and help alleviate it. My integrative approach allows your body to guide the session, ensuring an experience specifically tailored to your unique, individual needs. This is a full body massage, including feet, hands, scalp, and face (if desired). Soothing music, hot towels, custom padded table, and heated table enhance the relaxation experience. You can relax and slumber an extra 15 minutes after the massage for an extra charge. The result is a deeply relaxing therapy that still addresses pain, stiffness, and tension in the body. Finally, I can teach you self-care exercises to help maintain the progress we’ve made during your session. And I will follow up with you a couple days after treatment to see how things are progressing, assess what kind of improvement you feel in pain relief, and determine if additional sessions are needed. “First, let me say that I am EXTREMELY picky about choosing massage therapists, since I am quite sensitive to energy. Steve Shepard of Modern Bodywork met and exceeded all my high standards. Before my first session, he took a very personalized approach, reviewing my intake form and asking several relevant questions to zero in on specific issues. During the 90-minute massage, his just-right firm, healing touch managed to locate and soothe every single knot in my upper back, neck and shoulders from my constant computer work. He also demonstrated his advanced training in TMJ conditions, by relaxing my jaw joint from its mild, but annoying “clicking” on one side; this is a specialty area where Steve seemed particularly knowledgeable. I appreciated his professionalism, respectfulness and warmth...and will definitely be back for more in the future, next time I visit Santa Barbara! I recommend him without hesitation. “He takes his craft seriously, and each time I have been pleased with how my body feels afterwards—sometimes for days. I have had literally hundreds of massages in my life and Steve ranks among the top. “I’ve experienced the good, the bad, and the ugly massages in Santa Barbara, and I am currently on cloud nine after my 60 minute prenatal. Thank you so much Steve Shepard for the amazing massage tonight. Steve was professional, receptive, convenient, perfect pressure! Please contact him for your next massage, you won’t be sorry! “Pregnancy can be an uncomfortable time for the body- but Steve’s prenatal massage has left me feeling like I’m floating through the rest of my day. His pressure was PERFECT and he was easily able to access some hard-to-get-to spots (i.e. the SI joint and QL) that frequently get worked throughout pregnancy. His friendly, professional demeanor made me feel at ease and comfortable throughout the entire massage and I cannot thank him enough for the wonderful experience! Nestled in the beautiful and serene Las Aves office complex in Montecito across from the picturesque Andree Clark Bird Refuge not far from Santa Barbara’s East Beach. Modern Bodywork is located inside La Playa Pilates: The premiere Pilates studio in the Santa Barbara/Montecito area. Modern Bodywork provides one of the coolest massage settings anywhere. Vintage mid-century furnishings and decor give the space a vibe you won’t find anywhere else. Add a generously padded stationary massage table and face cradle, along with choice of music and you will find it the perfect place to relax, refresh and restore yourself.